Paranormal Blog: Atlantis Found in Google Ocean? 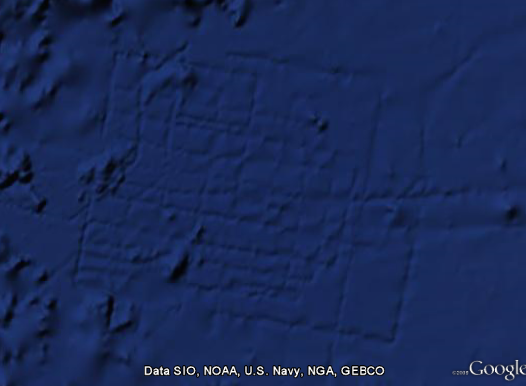 Atlantis Found in Google Ocean? The image below is of the ocean floor west of Africa, near the Canary Islands. It has caused something of a stir since it was reported by Britain's The Sun newspaper last week under the headline "Is This Atlantis?" Interestingly, the image is very close to the most popular proposed location of Atlantis, according to archaeologist Dr Charles Orser (New York State University). Yesterday, however, Google posted a blog entry explaining that the lines in the image are called "ship tracks". They are a side-effect of the technology used by ships to map the ocean floor. It turns out the same tracks can be found all over Google Earth where ships have mapped the ocean floor. While initially this looked like a promising sign for Atlantis enthusiasts, unfortunately it seems like there's nothing in it after all. Uhh, Google already has a project codenamed Project Ocean - its for their ambitious scan every book and provide it online...so would have been good to mention that!